Build your own metal detector to find studs, search for metal in the sand, detect electrical lines, etc. To come up against an electric cable while drilling a hole in a wall can have catastrophic consequences. Likewise, drilling into gas, water pipes or central heating pipes can be extremely hazardous. With a handy metal detector it can now be determined beforehand whether there are metal objects to be found in a wall, ceiling or floor. An LED indicates if a metal object is in the vicinity. 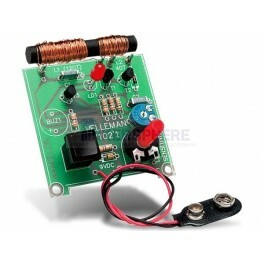 If an audio signal is also desired, space has been provided on the PCB for a buzzer.